One of the topical issues in our profession today, is the poor welfare package for young lawyers and this is for understandable reasons. The demographics of lawyers shows a distantly outnumbered senior lawyers as against the growing multitude of young lawyers. Indeed, the Nigerian Law School on a yearly basis, turns out a great number of young lawyers such that, it is beginning to seem that there are more young lawyers scrambling and rushing after increasingly fewer job opportunities and spaces. With this development comes consistent complaint around poor remuneration packages translating to lower living conditions for lawyers. It is therefore imperative, urgent and critical, beyond election pitches and rhetorics, that amelioration of living conditions for young lawyers be taken seriously, by the NBA at the national level. I.	Mentorship Scheme and Capacity Building for Young Lawyers. Mentorship requires the mentee to identify a role model in the profession, preferably, a successful practitioner who will guide the mentee on the path to successful legal practice and also the ethics and traditions of the Bar and practice generally. NBA under my watch will encourage and actively facilitate such mentorship programs. A modified version of such program, as earlier mentioned, would involve periodic visits by young lawyers who are practicing in the provincial branches to structured Law Firms in the cosmopolitan cities and branches to see and learn, first-hand, law office management and the practice of law in those Law Firms. This programme will be implemented in partnership with local and international law firms, Bar Associations and Law Societies of other countries, and training consultants. II. Employment or Job creation for lawyers. Many lawyers are finding it difficult to eke out a living and this is a worrisome trend. If I get elected President of the NBA, I would spearhead NBA's engagement with relevant stakeholders, to identify within Government Ministries, Departments and Agencies (MDAs) and from extant laws, those roles for which lawyers are best suited, given our training, and ensure that the legal market is protected for lawyers. I would also explore new vistas of opportunity for legal work that would result in enhanced income for lawyers and thereby improve the ability of senior lawyers and law firms to properly remunerate the young lawyers working with them. III. As a corollary to the preceding proposition, my administration as the NBA President will check the incursion of non-lawyers, foreign lawyers and foreign law firms into the Nigerian legal practice. 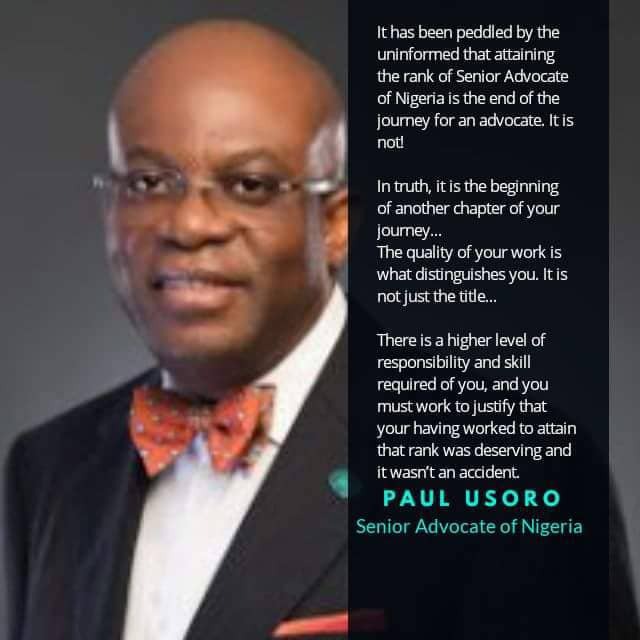 I do not believe that there is any aspect of legal services, including transaction and arbitral matters that we cannot find capable Nigerian lawyers to handle. There could be a limited access principle whereby foreign lawyers may be led in transactions and arbitral proceedings by Nigerian lawyers, the Nigerian lawyers being the ones to nominate, agree with and assign portions of the assignment to the foreign lawyers and firms. This could be made part of negotiations in the process of regulating access into the Nigerian legal market by foreign lawyers and firms. IV. Aged Persons and Persons Living with Disability. Persons living with disability and the aged have special needs which unfortunately are not generally catered for in our Nigerian environment. These needs include access facilities into buildings, toilet facilities, specialized reading and legal practice materials and aids, customized technology aids and facilities. My administration as the NBA President will work at installing these facilities at the NBA Secretariat where the model law office would be located. The model law office at the National Secretariat would also be made friendly to and usable by agreed persons and persons living with disability. These facilities would gradually be expanded and provided at the NBA Zonal Offices in the 3 Zones of the NBA. We would also open dialogue with the Chief Justice of the Federation and the heads of various courts in the Federation and the States on the required modifications for making the courts and the court facilities accessible to and usable by the aged and persons living with disability. More importantly, we shall dialogue constantly with these categories of lawyers to continually understand their needs and how best we can assist in meeting them. V.	As a corollary to the preceding proposition, we would advocate and push for diversity in the workplace, notably in law firms, in a manner that would advantage persons living with disability as well as the aged who may still be intellectually fit and can contribute to the society and the profession. My administration, with me as the NBA President, shall actively advocate against discrimination at the workplace on grounds, amongst others, of gender, age and/or physical disability. VI. With NBA under my watch, we shall actively develop, maintain and constantly update at the National Secretariat, a verifiable database of Nigerian lawyers who have specialized knowledge and skills in various areas of law, either through practice or by education. Such a database would come in handy not only to blunt the constant put-down by Nigerian governments and their officials against Nigerian lawyers but also to positively assist such Government Agencies and private-sector companies and individuals in identifying skilled lawyers that could assist them in handling so-called complex and "novel" transactions and matters. VII. Business Education and Investment Planning for Lawyers. As earlier mentioned, we shall include basic business management and strategic planning, financial accounting, investment planning and opportunities modules in NBA's Continuing Legal Education programs, all structured as part of Law Office Management courses. This will enlighten and educate lawyers on the imperative of strategic planning for sustainable law office management. VIII. Creation of NBA Welfare Foundation or Charity Funds. Bar Associations worldwide maintain Charity or Welfare Funds that help to cushion their members and/or their families and dependents against hardship. Examples of such hardships include death in the course of NBA work, accidents and/or medical conditions that occasion disability, natural disasters, and displacements occasioned by insurgency. We shall create and maintain such NBA Welfare Foundation or Charity Funds during our administration and the funds therefor shall be sourced from extant NBA income streams, donations and through special launching events.